What is with the all strange Google Earth findings lately? It seems people are finding odd things with the Google Earth software at an alarming rate these days. Last week, we showed you humanoid giants near the Giza pyramids and a sea monster off the coast of Antarctica. This week a new strange find comes in concerning a large underwater object found off the coast of Mexico. It was found by an anomaly hunter from Argentina who was searching for bizarre and unusual things on Google Earth. It seems he found what he was looking for. The object measures to be around 8.5 miles in diameter and is shaped similar to a pyramid – or even an aircraft with wings. What’s even more odd is that this structure or object appears to have a light glow. So, what could this 8.5 mile glowing structure be? 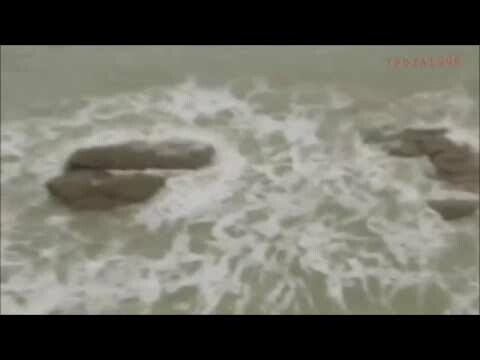 Some speculate it is nothing more than a natural formation in our ocean, while others are saying it could be an underwater pyramid, a UFO, or even an alien base. The theories are varied, but one thing is certain – this thing is huge and glowing. Whatever it may be, it sure is capturing the attention of the internet. What do you think it is? Secret underwater alien base? A crashed UFO? A pyramid lost to the elements? We want to know what you think! Let us know in the comments below. « Creepy Footage of Possessed Teddy Bear	» Ghost or Spirit Captured in Photo of Fatal Motorcycle Crash?